A cable used to connect the GameCube (GCN) and the Game Boy Advance (GBA). Small games can be downloaded into the GBA, the GBA may be used as a second screen to supplement gameplay, or the GBA can be a separate controller. By using this cable and a Game Boy Player accessory, a Game Boy Advance can be used to control a Game Boy game being played on the GameCube. The cable has one end that plugs into a GameCube controller slot and another end that plugs into the GBA's extension port. It is the descendant of the Transfer Pak. The cable is compatible with the GameCube and the original Wii on the console side, and the Game Boy Advance, Game Boy Advance SP, Game Boy Player, and e-Reader on the portable side. 01-11-2019 kreton Description Part number DOL-011. A cable used to connect the GameCube (GCN) and the Game Boy Advance (GBA). Small games can be downloaded into the GBA, the GBA may be used as a second screen to supplement gameplay, or the GBA can be a separate controller. By using this cable and a Game Boy Player accessory, a Game Boy Advance can be used to control a Game Boy game being played on the GameCube. The cable has one end that plugs into a GameCube controller slot and another end that plugs into the GBA's extension port. It is the descendant of the Transfer Pak. 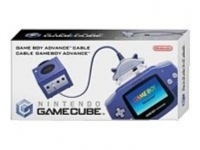 The cable is compatible with the GameCube and the original Wii on the console side, and the Game Boy Advance, Game Boy Advance SP, Game Boy Player, and e-Reader on the portable side. 02-17-2016 texasbabymunch Description A cable used to connect the GameCube (GCN) and the Game Boy Advance (GBA). Small games can be downloaded into the GBA, the GBA may be used as a second screen to supplement gameplay, or the GBA can be a separate controller. By using this cable and a Game Boy Player accessory, a Game Boy Advance can be used to control a Game Boy game being played on the GameCube. The cable has one end that plugs into a GameCube controller slot and another end that plugs into the GBA's extension port. It is the descendant of the Transfer Pak. The cable is compatible with the GameCube and the original Wii on the console side, and the Game Boy Advance, Game Boy Advance SP, Game Boy Player, and e-Reader on the portable side. This is a list of VGCollect users who have Nintendo GameCube Game Boy Advance Cable in their Collection. This is a list of VGCollect users who have Nintendo GameCube Game Boy Advance Cable in their Sell List. This is a list of VGCollect users who have Nintendo GameCube Game Boy Advance Cable in their Wish List.